5 years & up. The hunt is on! 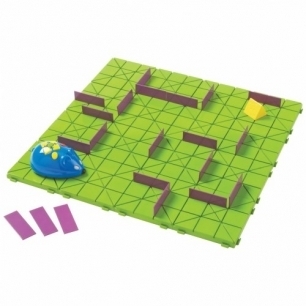 Customize your maze, then program the mouse to find the cheese. The inventive possibilities are endless. It's the perfect introduction to the concepts of coding, early engineering, step programming, and critical thinking. This deluxe science set includes 16 pieces to create a 20" x 20" maze board, 25 wall tiles to create paths that are straightforward, winding, and everything between, and sequence cards to plot your way to the cheese while tracking every step! Mouse measures approximately 4"H x 3W".